BUFFALO, N.Y. -- The Bisons headed into the 1933 Junior World Series after an incredible run through the playoffs. The Herd finished the regular season red hot, qualifying for the postseason on the season's final day, despite an 83-85 record. 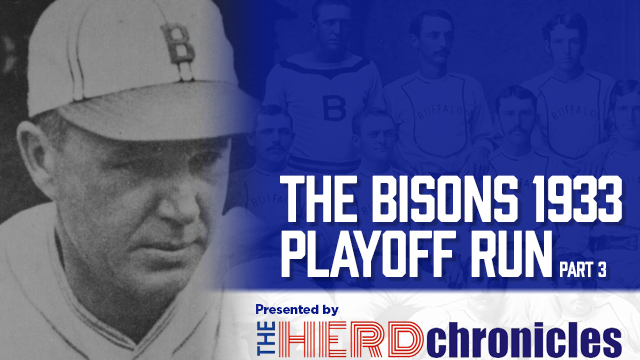 Buffalo swept Baltimore in the first round of the playoffs and then scored 42 runs in their final three games against Rochester to become the International League Champions. The Herd immediately headed to Ohio to take on a well-rested Columbus Red Birds team in the Junior World Series. Columbus was the second consecutive St. Louis Cardinals affiliate Buffalo battled in the playoffs. The Red Birds had a powerful lineup led by Nick Cullop (.313, 28 HR, 143 RBI), Bill Delancey (.285, 21 HR, 97 RBI), Jack Rothrock (.347), Burgess Whitehead (.346), and Benny Borgmann (.340). They also had one of the strongest pitching staffs ever assembled in the American Association, led by fireballers Bill Lee (21-9, 3.79 ERA) and Paul Dean (22-7, 3.15 ERA), along with southpaw Clarence Heise (17-5, 3.88 ERA). The Red Birds ran away with the American Association Eastern Division, going an amazing 101-51. In the playoffs, they finished off Minneapolis in six games and then waited to see who their International League opponent would be. The Red Birds were heavy favorites to beat Buffalo in the best of nine series, but the scrappy Bisons team battled long odds all season and they were not lacking in confidence. Team President Frank Offermann stated that "We're going to crack right through Columbus. Our boys can't be stopped. They've got all the confidence in the world and feel that man for man they're superior to the American Association champions. If the team gets an even break in Columbus, we will quickly wind up the series back on our field." The first four games of the series would be played in Columbus, followed by a potential five games in Buffalo. Bisons manager Ray Schalk sent left-hander George Milstead (5-14, 5.34 ERA) to the hill in game one against Bill Lee, who dominated the American Association all season. Buffalo jumped on Lee early, scoring a pair of runs off the big right-hander, highlighted by an Ollie Carnegie RBI single. But the Red Birds tied the game in their half of the inning on a monumental blast by Nick Cullop, which W.S. Coughlin described in the Courier-Express: "Cullop equalized Buffalo's first inning spurt by propelling the ball on a dead line from the plate far over the center field wall at a mark designated as being 420 feet from the plate. Cullop is the only player known to have achieved the feat in the park, and this was the fourth time he has turned the trick." The Bisons answered back with a "tremendous clout" of their own, as Len Koenecke drove one over the right-center field fence. The homer gave the Bisons center fielder 11 hits in his last 16 at-bats. Buffalo sent Lee to the showers when Bucky Crouse doubled off the wall to score Ollie Carnegie. The Herd had scored seven runs on 10 hits off Lee in just 4.1 innings. After George Milstead's rough first inning, he settled down and lasted into the eighth. Buffalo held on to win 7-6 to take an early lead in the series. The victory gave a boost to a team already bubbling with confidence. Manager Ray Schalk summarized the situation and issued a bit of a warning to his players, saying: "We staggered into the playoffs; we started to crawl against Baltimore; we started to walk against Rochester; and now we're running full speed against Columbus. But let's not lose it all through overconfidence." In game two, the Bisons faced Paul Dean, younger brother of major league star Dizzy Dean. The 21-year old led the American Association in wins (22), ERA (3.15) and strikeouts (224). Buffalo countered with Johnny Wilson (15-6, 4.11 ERA). Ollie Tucker gave Buffalo the early lead with a two-run homer in the first, but Dean settled in and shut down the Bisons until the sixth, when they brought home a run on an error, knocking Dean out of the game. However, from that point on, the Red Birds power-laden lineup carried them to victory. Towering home runs from Mickey Heath, Nick Cullop and Jack Rothrock, helped Columbus even the series at a game apiece. It was only Buffalo's fourth loss in its last 19 games, prompting Ray Schalk to exclaim "Well, you didn't expect us to win all of them, did you?" A bit of a controversy developed early in the series, due to lower than expected attendance figures. The players had an interest in fan turnout, since a portion of the receipts from the first five games would be divided among the players. Low attendance at the first two games seemed to be caused by a number of factors, including morning showers and threatening skies. However, some Buffalo players complained about the time of the games. Bisons second baseman Fresco Thompson argued that "If the game had been played at night we would have drawn at least 7,000 and that would have given us all a break on the split between the two clubs… But as it is we're liable to owe some money for playing them." Back in Buffalo, fans were closely following the series on a playograph machine outside the Main Street office of the Buffalo Evening News. An announcer stated who was at the plate, as metal figures reenacted the action of the game in virtual real time. Several thousand fans turned out to watch the playograph to keep updated on their beloved team. The next two games were rained out, allowing Columbus's Paul Dean to start consecutive games on just two days rest. The Bisons countered with Phil Gallivan (15-15, 5.13 ERA). Another wet, soggy, drizzly day in Columbus helped keep attendance down to just 5,035. Once again, Buffalo jumped on top in the first inning on a two-run single by Ollie Carnegie. It marked the fifth straight game in which the Herd scored at least two runs in their first at-bat. Dean was able to survive the opening inning by getting Bisons catcher Bucky Crouse, the eighth hitter to bat in the inning, to pop up to the catcher with the bases loaded. But the Red Birds bats also started off hot. Columbus scored four runs in their half of the first, highlighted by a three-run home run by Jack Rothrock, to take a 4-2 lead. At that point Paul Dean took over the game. The Columbus hurler "held the Herd completely at his mercy," allowing only two hits in the next seven innings, before a ninth inning Buffalo rally fell short. Columbus won 8-5, as Dean won back-to-back games to vault the Red Birds to a two games to one lead in the series. Game four was the final game in Columbus, before heading to Buffalo to complete the series. The Buffalo Evening News wrote that "Although neither would admit it, both Ray Schalk, manager of the Bisons, and Ray Blades, pilot of the Birds, regarded this contest as the 'key' game of the series." Either Buffalo would tie up the series before heading home, or Columbus would take a commanding three games to one lead. Unfortunately for the Herd, things did not go their way. A pair of lefties went to the mound, as Buffalo's Charlie Perkins (12-13, 3.88 ERA) took on Columbus's Clarence Heise (17-5, 3.88 ERA). Perkins had won five straight starts, allowing only five runs in his previous 36 innings. However, he wasn't at his best on this day, as Columbus chipped away to a 6-0 lead through five innings and never looked back. Ollie Carnegie's three hits, including his 32nd home run of the year weren't nearly enough to bring the Herd back. Columbus won 11-5 to take a three games to one lead in the series. It may be a surprise to the American Association champions to find so much enthusiasm and optimism in this city under the circumstances. Obviously when a club has not made a better showing its followers lose heart, confidence etc. But the visitors will not find a Buffalo in that frame of mind… Followers of baseball here have known the Bisons to be counted out prematurely too often this season. They know the fighting qualities of the players and the result when they begin to click. Ray Schalk, ever the optimist, proclaimed that "We lost three out of four games and the boys were guilty of a great deal of bad baseball. But I think they've got it out of their systems and the tide will turn Saturday night." The Bisons would answer their manager's call and once again play like champions. Game one winner George Milstead took the mound against Jim Winford (10-6, 3.80 ERA) in game five. "Lefty" Milstead was on his game, allowing just 10 scattered hits and three run in a complete game win. The Herd rallied for three runs in the second, capped by a two-run bases loaded single by Joe Brown, much to the delight of the crowd. Once again, Bisons fans celebrated throughout the game, just as they had in the Rochester series. The Buffalo Times wrote "Tin Horns… were tremendously in evidence. Couple these thousands of horns with hundreds of cowbells and whistles and plain, old leather-lunged yelling and there was enough noise at Bison Stadium during the last half of the second inning to keep nervous folk awake in East Aurora." Buffalo scored a run in both the fifth and sixth innings, and a pair in the eighth, en route to a 7-3 win, giving Milstead his second victory of the series. Another small, but boisterous crowd met the teams for game six. Ray Schalk gave the ball to Charlie Perkins, hoping for a bounce-back game from the southpaw. After struggling in game four in Columbus, Perkins had proclaimed that "I just had an off game. I'll catch them when we get back home." His statement proved to be prophetic. The Herd scored a pair in the first inning, on a two-run single by Fresco Thompson. Then in the second inning, Len Koenecke pulled off a straight steal of home. W.S. Coughlin wrote that Koenecke's "brilliant dash was the essence of perfection and he was sitting on the plate by the time catcher Delancey received Lee's pitch." Koenecke slid between the right handed hitting Fresco Thompson's legs to reach the plate, as the crowd roared. From that point on, the game was all Bisons, as Charlie Perkins led the Herd to a series tying victory. In the seventh inning, Columbus ace Bill Lee completely imploded. He walked four batters to give the Herd another run, and hasten his exit from the game. The Bisons sealed the win in the eighth, when Greg Mulleavy sent one over the left field wall and Koenecke singled home Joe Brown, to put the Herd up 7-4. Just as Charlie Perkins predicted, he was much more effective at Bisons Stadium than he'd been in Columbus. Perkins "completely mystified the invaders" allowing only seven scattered hits in a complete game victory, to record his sixth win in seven starts. W.S. Coughlin wrote that: "Charles Perkins, fastidious Bison portsider, administered the lethal potion that set the visitors down for the second straight reverse by a score of 7 to 4 and the Schalk warriors now are square with their inflated American Association adversaries after six contests." Despite the Bisons success, attendance at Bison Stadium was much lower than the previous series against Rochester. Many factors were blamed for the smaller crowds. Bill Abbott wrote in the Buffalo Times: "It is obvious radio is seriously hurting stadium attendance. However it isn't the only cause. Higher prices for the Columbus series, which never should have been ordered, have kept many of the faithful away. And weather better suited for football contributed to hold down the crowd." Even though the crowds were smaller, the newspapers repeatedly remarked how noisy and enthusiastic the fans were. A heavy misty fog overtook the field and created an ominous setting for game seven of the best of nine series. W.S. Coughlin wrote that the foggy haze made "conditions as close to blindfolded baseball as this writer has ever witnessed. The outfielders, particularly the Red Birds, adorned in their gray uniforms in keeping with the fog, were almost obscured from the view of those in the press box." Paul Dean took the mound for Columbus looking for his third win of the series. He was everything he'd been in his first two starts and more. After allowing a run in the first inning, Dean started "mowing down the Bisons with monotonous regularity." The Red Birds offense was powered by Mike Heath who walloped one of the longest home runs of the season into the Woodlawn Avenue area, and Nick Cullop, who hit a two-run triple. But the story of the game was Dean. From the second to the eighth inning, he shut the Herd down, holding them hitless in six of those frames. He gave up a meaningless run in the ninth, finishing with a complete game win, allowing just four hits and striking out 11 in the Red Birds 7-2 win. Dean won his 25th game of the year and third of the series, while raising his strikeout total for the season to an eye-popping 224. With their backs against the wall, trailing four games to three in the series, manager Ray Schalk tried to encourage his players saying "…we will be a much better ball club in the next two games than we were Monday. There was a great deal of bad baseball and some poor pitching in spots, but that is out of our systems now, and watch our smoke Tuesday." All three of Buffalo's victories in the series had been won by left-handed pitchers. So, Schalk decided to send another southpaw to the mound in the crucial eighth game. He went with George Milstead, who'd already won games one and five, to face right-hander Jim Winford. The Bisons took a short lived lead in the first, when Ollie Carnegie doubled home Ollie Tucker, but from that point on, the Red Birds dominated the game. Milsted was taken out after Columbus's four run third inning. The Red Birds continued to add to their lead, and when the dust settled, they won the game 10-2 and triumphed in the series five games to three. Bisons manager Ray Schalk was gracious in defeat, saying "the boys fought a good fight to the last ditch. All credit to Ray Blades and his junior champions. That's the sentiment of all my men." The Junior World Series gave the Bisons another opportunity to show their mettle, as they had time after time during their playoff run. Buffalo made a valiant stand after returning from Columbus, coming back from a three games to one deficit, to tie the series. Ultimately, their comeback fell short, but after their late season drive to make the playoffs on the season's final day, their amazing run through the International League playoffs, and the fight they showed in the Junior World Series, the 1933 Bisons earned their place in Buffalo baseball lore. After the Herd's incredible run, W.S. Coughlin wrote in the Courier-Express that "the current season offers a red letter page in the annals of local baseball. The tag of miracle men will still attach to the local players on the merit of their achievements and will offer food for discussion, not only locally, but throughout the nation…" He added that "Neither will the memory of the sensational crowds, attesting to the loyalty of the local fans, drawn by a team that was almost hopelessly out of the race throughout a large portion of the season, be forgotten for many a full moon." The 1933 "miracle men" are a team to be remembered in the franchise's storied history.